Star Trek: was Cumberbatch supposed to be Gary Mitchell? - Den of Geek! Star Trek Into Darkness is a 2013 American science fiction action film directed by J. J. Abrams and written by Roberto Orci, Alex Kurtzman, and Damon Lindelof. It is the 12th installment in the Star Trek film franchise and sequel to the 2009 film Star Trek. The film features Chris Pine reprising his role as Captain James T. Kirk, with Zachary Quinto, Simon Pegg, Karl Urban, Zoe Saldana, John Cho, Anton Yelchin, Bruce Greenwood, and Leonard Nimoy reprising their roles from the previous film. Benedict Cumberbatch, Alice Eve, and Peter Weller are also credited in the film's principal cast. The film was the last time Nimoy would portray the character of Spock before his death in 2015. Set in the 23rd century, Kirk and the crew of the USS Enterprise are sent to the Klingon homeworld seeking former Starfleet member-turned-terrorist John Harrison. After the release of Star Trek, Abrams, Burk, Lindelof, Kurtzman, and Orci agreed to produce its sequel. Filming began in January 2012. Into Darkness's visual effects were primarily created by Industrial Light & Magic. The film was converted to 3D in post-production. Star Trek Into Darkness premiered at Event Cinemas in Sydney, Australia, on April 23, 2013, and was released on May 9 in Australia, New Zealand, the United Kingdom, Europe, and Peru, with other countries following. The film was released on May 17 in the United States and Canada, opening at IMAX cinemas a day earlier. 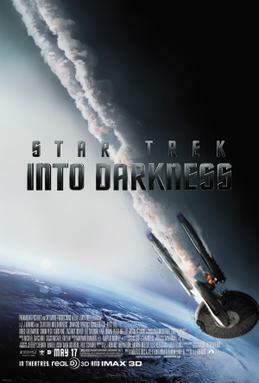 Into Darkness was a financial success and received positive reviews from critics. Its gross earnings of over $467 million worldwide made it the highest-grossing entry in the Star Trek franchise. A sequel, Star Trek Beyond, was released on July 22, 2016. All credit goes to Paramount Pictures.